The Distinguidos first appeared in the Cuaba Millennium Jar 2000 then in the Cuaba Estuche in 2002. 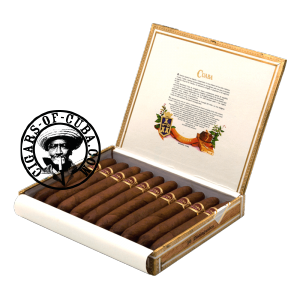 Slightly smaller than the Salomon, this cigar is ideal for aficionados of the Perfecto shape. A cigar that is impressive, already in the hand. The big ring gauge makes this Double Figuardo special, allowing for all the rich flavors to be enjoyed in a warm, gentle smoke. The finish will be intense as the pointed shape amplifies every last ounce of power in this cigar. Huge aging potential on these impressive cigars.